1. Go to https://connect.arc-ts.umich.edu/ and click on the blue “Login Here” button. 2. Choose your institutional affiliation. (Just start typing your institution’s name). 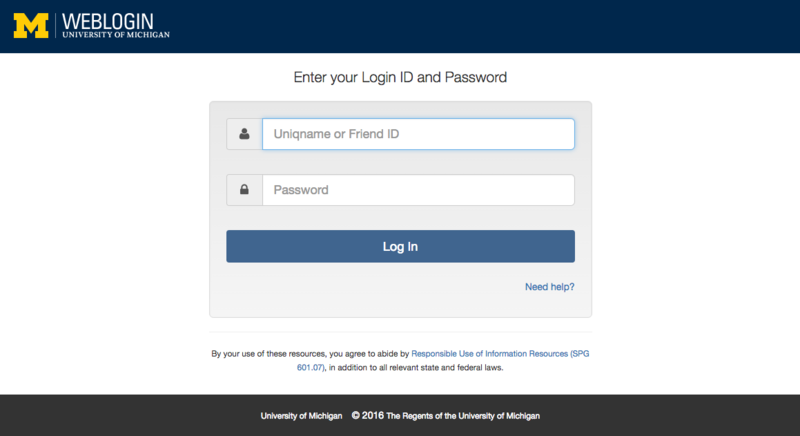 If you have a University of Michigan uniqname and Kerberos password, you should select “University of Michigan.” Otherwise, choose your home institution. 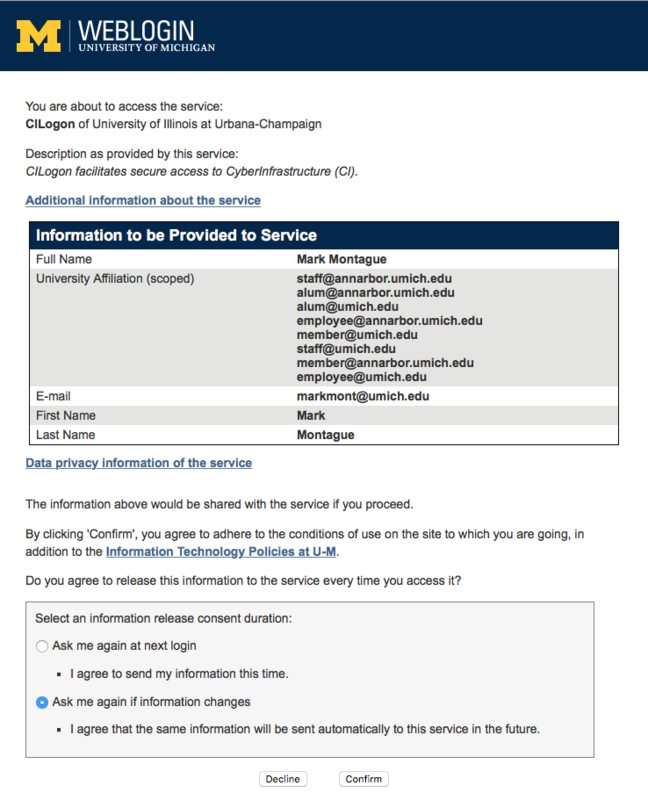 NOTE: Currently, due to data use agreement compliance requirements, researchers affiliated with institutions other than the University of Michigan need to be sponsored as an academic affiliate (obtain a U-M uniqname and password) and connect to the U-M VPN before accessing ARC Connect, even if they will be choosing their home institution from the menu above. If this affects you or your collaborators, please let us know at hpc-support@umich.edu. You can check the “Remember selection permanently” box to skip this step in the future. Click the “Select” button to proceed. 3. 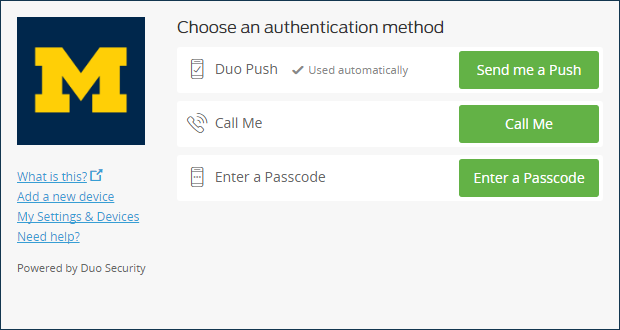 Log in using your username, password, and additional factor (for example, a tokencode or Duo Push notification) for your home institution. NOTE: In order to use ARC Connect, your home institution must support Shibboleth with Multi-Factor Authentication (MFA). If you are not sure if this is the case, or if it is not working, have the IT support staff at your home institution contact hpc-support@umich.edu. 4. Approve request from the CILogon service to send ARC Connect an X.509 certificate that will permit ARC Connect to temporarily act on your behalf. The certificate will only be valid for 8 hours and it will be destroyed when you use the ARC Connect logout button. Click the “Log On” button if you agree. (If you do not agree, just close the web browser tab — you will not be able to use ARC Connect). You can check the “Remember this selection” checkbox to automatically approve certificates whenever ARC Connect requests them in the future, skipping this step. 5. 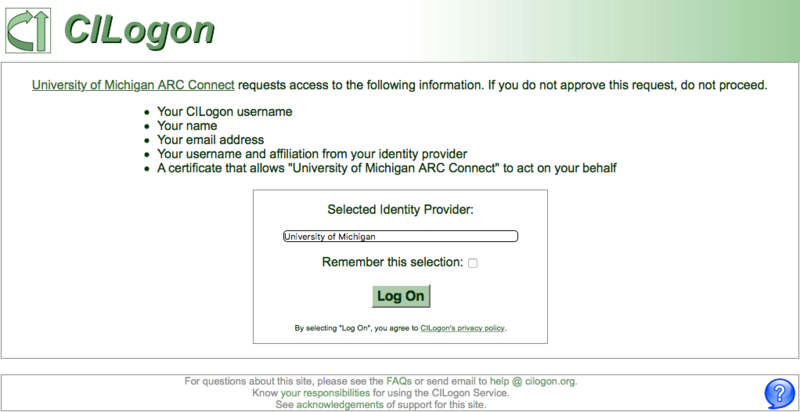 Approve request from your home institution, if necessary, to share some of your personal information with the CILogin. University of Michigan users will only be asked upon logging in for the first time (unless the “Ask me again at next login” button is clicked). Click the “Confirm” button if you agree, or the analogous button on your home institution’s approval page. 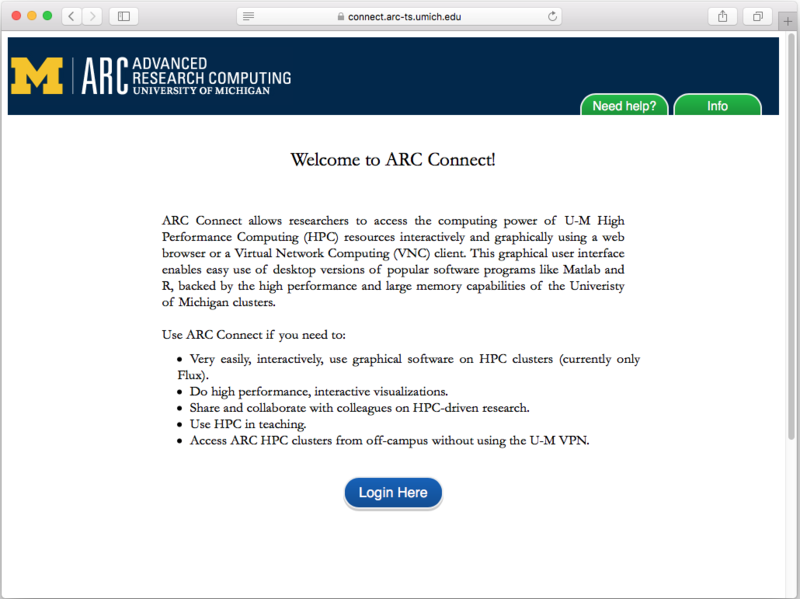 (If you do not agree, just close the web browser tab — you will not be able to use ARC Connect). You are now logged in to ARC Connect and can submit jobs to ARC-TS clusters via the “Job” tab. For detailed instructions on how to submit jobs, see Starting a job. The first time you log in to ARC Connect, your web browser should prompt you regarding whether to allow ARC Connect to send you notifications to let you know when your jobs start running. If you allow this, you can do other work while waiting for jobs to start without having to check the Jobs tab to see if your job has started yet.